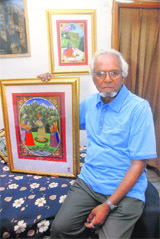 Years ago when Himachali artist Naresh Pandit borrowed techniques from the Pahari school of painting to capture contemporary themes, critics hailed it as a step in the right direction to popularise miniature art. The trend saw eminent artists like Vijay Chouhan from Ajmer and homegrown artist Viren Tanwar doing their bit to contribute for the cause. Viren's latest series on miniatures by the name Every Life Has a Story did Chandigarh proud at Vienna Essl Museum in Austria last year. But nothing had prepared us for this. that OP Taak, who is known as one of the last crusaders of Kangra school of art, too would follow suit. As for introduction, Taak, a 1957 batch of the College of Art student, now settled in Dharamsala, is an expert in the Kangra shaily chitrakala with 47 years of experience and more than 5,000 paintings. He was initiated into this particular genre by Gulabo Ram during the 1960s; the name to reckon with when it comes to Kangra miniatures. Coming to the changes that Taak is bringing into his latest series, it has more to do with themes rather than techniques. Based on religion, Taak, through his paintings, has taken upon himself to narrate stories from the Guru Granth Sahib, the Bible and Islamic history. "Kangra school of miniature has always been about Hindu deities. Having painted enough of Hindu mythology, I wanted to bring elements from other religions too," says Taak, who is in the city these days. The inspiration came from the Mughal paintings he used to admire as a child at his native village Wazirabagh (now in Pakistan), and also places he visited like the Jama Masjid in Delhi, churches in Goa and numerous Sikh shrines in Punjab. As a Kangra shaily loyalist, Taak is not deviating from his usual style either in size or style. The 29 frames on Sikhism and 28 on Christianity and a few half-painted ones on Islam still has the trade marks of Kangra paintings - side profile of the figures, the Dhauladhar mountain range for the background and detailing up to the borderline, and of course, colours made from natural sources. "Don't miss the titles because the title is one of the major elements when it comes to miniature paintings. Unlike the abstract artists who paint first and then tag it as 'untitled', we miniature artists first work on the title and then the storyline," Taak injects, making a dig at abstract art. The bitter tone comes from his experience of working with younger artists. "Painting miniatures is a tough job. One needs to sit continuously at least for eight to 10 hours daily. Younger generation is after quick fixes. Many budding artists show interest to learn the craft but after doing it for a while they shift gear, opting for abstract art," he explains. So, to keep the tradition alive or rather to make it more palatable for the younger generation, all this 73-year-old would do is introduce modern subjects like the fishermen community or contemporary Himachali culture to his frames. "With this religious series, I wanted to bring alive the concept of Hindu-Muslim-Sikh-Ishai… which I grew up listening to," he signs off; and we are left with the thought, what a befitting pilgrimage for a man who worshiped miniature art throughout his life!